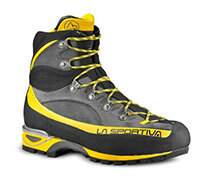 I went to Cotswold Outdoors (outdoor gear retailer in the UK) to have a pair of boots fitted for my winter adventures. I had both of my feet measured (length and width); tried on different boots from different brands; tried on different sizes; I then tried different inserts into the boots and footbeds (insoles) before finding the right ones. It took 2 trips and around 1 1/2 hours to arrange. But it will be worth it when I'm out in the snow in the winter. I also do general hill walking and various scrambles up rocks. For doing this, I use a different pair of shoes. They're often called 'approach' shoes but really they're like a cross between trainers and boots. These shoes are like boots but in a shoe form and pretty protective of your feet and ankles. I also do a bit of trail running (running on uneven ground like moorland or in the mountains) and again have a slightly different pair of shoes. They're similar to general walking shoes but are more like running shoes but with a tougher exterior and 'lugs' and grippy soles designed for running, for grip on mud and rock and to be supportive. Finally, I have a pair of climbing shoes. 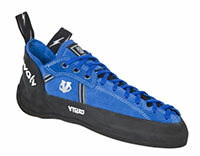 These are designed specifically for climbing. They are like having another foot outside of your foot! They're very tight, you don't wear socks and they're brilliant for gripping to the rock or indoor climbing / bouldering. Each of these serves a specific purpose. I could just use one pair of shoes and that is fine, but I am more effective when I use the right footwear for the right job. It means I’m more efficient, it’s more comfortable, I can do things better and am safer! I wouldn't want to wear a pair of climbing shoes out in the cold winter! In a way all these types of shoes are a good analogy for having feet that are ready with the good news and peace of the gospel. When the Bible talks about peace, what it means is God’s gift of wholeness. So the message that God has given us is good news and it brings wholeness to people - it helps them be everything God made them to be. Without this good news of Jesus, we'll never be everything we could be. The peace that God brings is the peace between God and man. This is the good news. The key here is to be ready. This is the readiness of the Gospel of peace. We get prepared – maybe have a short description of how and why you became a Christian and how God has changed your life. Or use a God-story – something God has done or is doing to show how God is working today. We can look at two great talks that Paul gave. These were in the book of Acts in chapter 13 when he spoke to Jews and in Acts 17 when he spoke to Gentiles (people who aren't Jews). So Paul's approach was unique to the situation. In Jerusalem, he spoke about the history of Israel and related that to Jesus. But in Athens, Paul used a different method, looking at the tomb to an unknown God and pointing people to that. Our nation used to know a lot about God but now people 'serve' and 'worship' loads of different gods. In a way, the country used to be like Acts 13 (where the Jews knew about God). But today our country is a bit more like the people of Athens in Acts 17 where people didn't really know God. Some people know about God but their aim is only to be hateful towards God. So we need to adapt our footwear so we’re ready to respond to people. And sometimes we have to walk away. So how did Paul do things in Acts 17? Paul saw there were many idols and he used what he saw to talk about God. The altar to an unknown God was his opportunity to discuss the true God. The Bible tells us to always be ready to give an answer. So that is our part – we give an answer. God does the supernatural bit as we speak and pray - and guides people towards his love. In Acts 17 we see a great example of relating well to the people around you. Paul visited Athens. In verse 16, Paul saw that the city was full of idols. ‘Aha!’ he thought, ‘here’s how I can connect.’ In verse 23 he said, ‘I see this is a very religious city (today we can say ‘there are many beliefs’).. I even see you have an altar to an unknown god.. so let me tell you about this god who is in fact the true God, the true way..’ We also live in a world with people seeking something, but they’re looking to the wrong thing. But we have the answer! Paul connected using ideology, examples, terms the people could relate to. And he used it well. We do the same at our church with clear language. We don’t dumb everything down but we remain Biblical relevantly and clearly. People around have their ‘unknown gods’. It’s our part to introduce them to the true God. When we speak God's life, people will react in different ways like they did in Athens. Some laughed, others wanted to hear more and others became believers. Some people from my church went around the local area to pray for people and to be an encouragement to them. One person was healed, other people were prayed for and were very happy. But one man told the team he was offended by them and another person knew they were Christians before they spoke to him - he told them to go away. This man clearly had issues with evil spirits in him. The people of Athens loved to discuss things – the Bible says an increase in knowledge is one of the signs of the end times. We are presented with the equivalent of 174 newspapers a day of information and we daily produce information 200 times more than 24 years ago (Telegraph online). It’s also a sign of our times with the web. There are many discussions out there. We just need to present the Christian point of view fairly, clearly and with love. Never get angry at people even if they hate you. They don't really hate you, they hate God. As we respond with God's love, people are shown the true God and how he loves them. We put the truth of God and his Word out there. Then God takes over! For example my church is part of Christians Against Poverty (CAP). Through this, over 150 people have been brought of of debt and many have come to know Jesus. Other people have come to know Jesus through invites to the Christmas Service, through flash mobs in town and through the worship at the church. Other times there are events. We've run events where young people come to faith. And in London in July 2017 at an event called 'Just One' put on by the evangelist J John, they wrote that over 6000 people became Christians. In another survey in mid-2017, the Hope foundation found that 13% of 11-18s are regularly attending church, praying and following Jesus. The Gospel message is Good News! Another thing to notice is that the book of Acts is called 'acts' because the book is about the acts and things that people did. It's not not just a book of words. We are called to the same thing - to act as well as to speak! We are bringers of God’s life - the shoes we wear are shoes about good news!! A friend is teacher in a school. As part of their Religious Education, they brought in people of different faiths and someone who didn't believe in God (an atheist). My friend said the talk by the atheist was brilliant because it was so dead, lifeless and without any kind of hope, that when the Christian got up to speak and God's life and love poured out, it showed the difference and what each belief system was really like! This isn't to mock the atheist man at all - just to show that God's love shines out of Christians! So we know that God is a good God and has given us Good News. So let's use all the shoes that we have - all the different ways that God calls us to use - and let's speak God's life into people that really need to hear and know the Good News!